I had the privilege of painting this image for a couple who commissioned me to do a piece for them honoring their new marriage. As I sat down to meditate and ask Spirit to guide me in receiving whatever image wanted to come through for them, it was like allowing my energies, their energies, and Spirit's energies to coalesce into a fully birthed image from its conception. Most all of the elements were there in the original drawing which really only took about an hour or two to draw out. There were certain things that absolutely wanted to be in there that spoke to Sacred Marriage. While I am not one to say a painting means "this" or "that" there are certain things that came to mind when I was designing the composition for "Sacred Marriage". I have listed some of the symbology down below. It was an amazing journey I felt like I went on from from it conception to birth. Or perhaps like a hobbit traveling from the Shire down a road fraught with peril, there were times when I thought I completely screwed it up and all was doomed. Sometimes I would ask for a dream at night to show me a way out of the mess that I had created and sure enough, Spirit/Soul/Source energy would provide me with a nudge in a certain direction to get back to sure footing-for at least a little while. Sacred Marriage might mean something different for you, and that is perfectly valid. I would love to hear what it means to you. For me, images are living, breathing things that can take on a life of their own and give us gifts of understanding as flashes out of nowhere. Hints. Sparks in the darkness. For me, Sacred Marriage is about the union of equal and opposite/complementary forces that hold our world together. It is about the Divine Feminine and Divine Masculine weaving together as One and giving birth to the myriad forms of this mysterious world of ours with pure love as the glue that holds it all in perfect union. 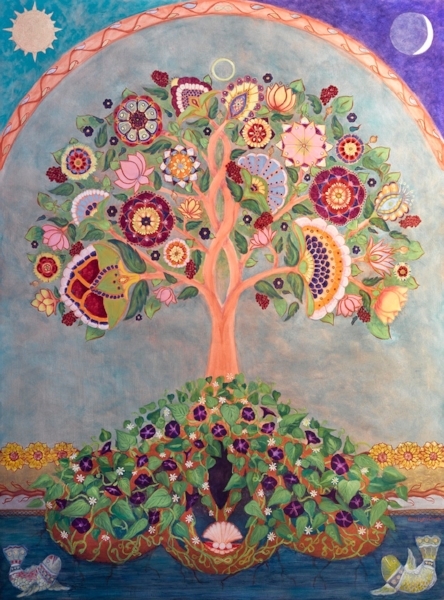 The flourishing crown of this World Tree contains vibrant flowers, healthy verdant leaves, new buds continuously springing forth, and seed pods that contain the seeds, blueprints, for all of Life. Eternal renewal. Above the crown is a golden circle which represents the perfection of Life, the circle of the seasons we experience, and pure harmony. The Ida and Pingala are 2 equal and opposite complimentary forces and channels of energy that rise up the spine and spiral around the central channel of the Shashumna. All begin at the base of the spine. The Ida begins on the left side, typically seen as the feminine side of the body, and the Pingala begins on the right which is considered the masculine side of the body. Males and females contain both feminine and masculine energies. The three vesica pisces in the trunk represents the trinities of Mother, Maiden, and Crone as well as the better know Father, Son, and Holy Ghost. I trust in the root of my being, the perfection of the Universe, even if it doesn't seem apparent to me. I trust. In sacred geometry Vesica Pisces is considered the womb of all life. It is the shape created from 2 interconnecting circles with the same radius. From the Oneness, the singularity of God/Goddess/Source/Void that contains all potential(insert your preferred term here:) separates to become two. Duality is born. From this separation, or division, multiplicity is created and birthed through the womb. The dark, warm color of this shape in the roots represents this place from where we are born and the place to which we all return, always enraptured with Love at our core. Even if we don’t feel it sometimes, it is there waiting to be rediscovered. Love drives all growth, all change, all life. Vining, twining, growing, thriving. Fresh green vibrant energy. New life. Receptive. Mothering. The Great Sea offers up her riches joyfully from the depths of her mysteries. Represents good luck, courage, attaining one’s highest goals, perseverance in adversity, and strength of purpose. Specifically, the golden koi on the tree’s left is a Yambuki Koi and represents riches and wealth. The white and red koi on the right is a Kuchibeni Koi and represents love and long lasting relationships. There are two infinity signs. One is above tree at the apex of the arch. The other is in the the roots, below the clam shell, created with the vines of the morning glories. As above, so below. The eternal now is ever present. Perfect harmony. Two become One. Sacred Marriage.